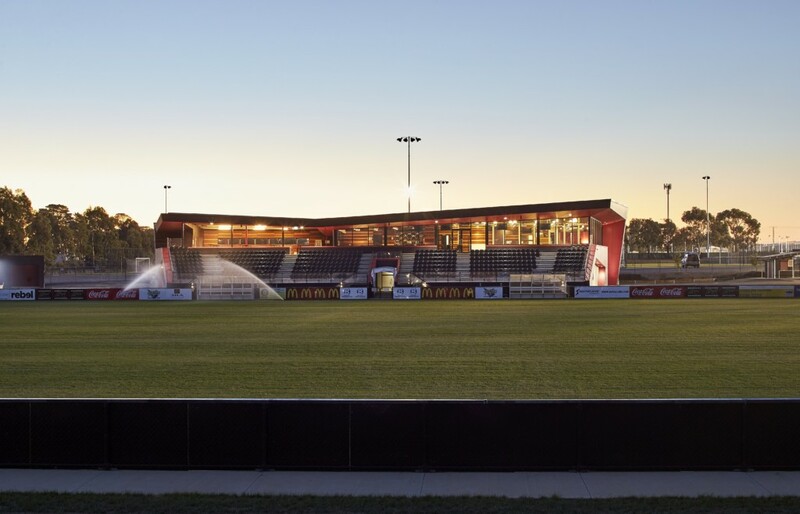 Located in the regional setting of Ballarat, Australia, Ballarat Regional Soccer Facility has been designed to provide leading edge sporting and social facilities for elite A level as well as international level games. 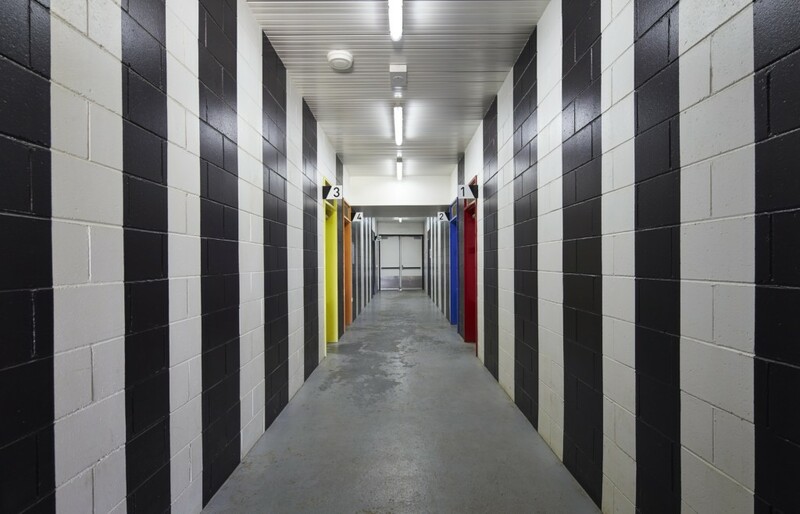 Designed as a series of stages that form part of a Master plan for the site, Stage 1 includes the BRSF building, a 2 star FIFA rated turf playing pitch and synthetic training ground. k20 Architecture also developed a masterplan for the site which will allow Council to continue to expand the facility in the future, and achieve their vision of a 10,000 seat stadium; which k20 Architecture anticipate will move the stadium from a regional to a national significance. 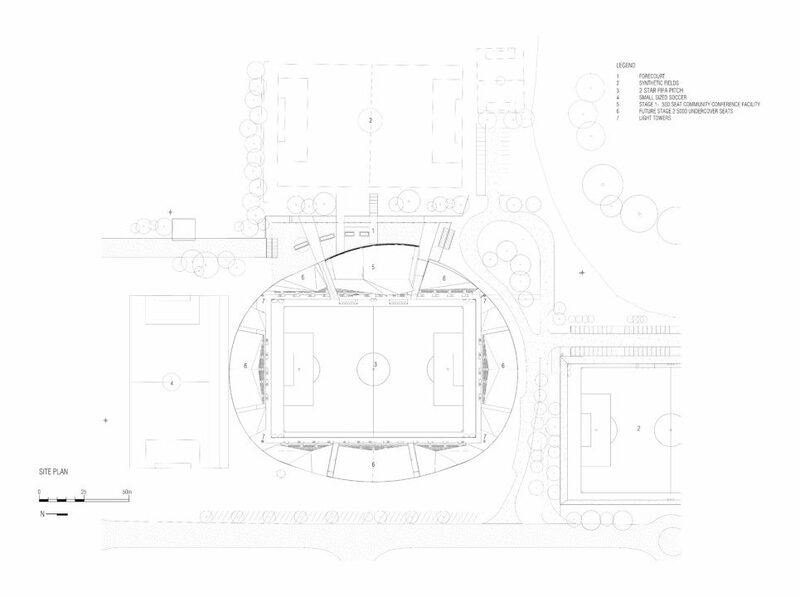 Discussions between the City of Ballarat and k20 Architecture about a new soccer stadium were first broached in 2010. 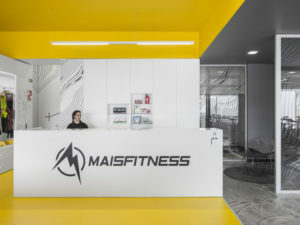 With only rudimentary amenities available on site, the idea for a new facility was on the council’s priority list. What council originally set aside was a relatively ‘healthy’ budget that would appease most architects. However, at the first meeting, the architects were presented with a budget of almost 25 per cent of the original figure. 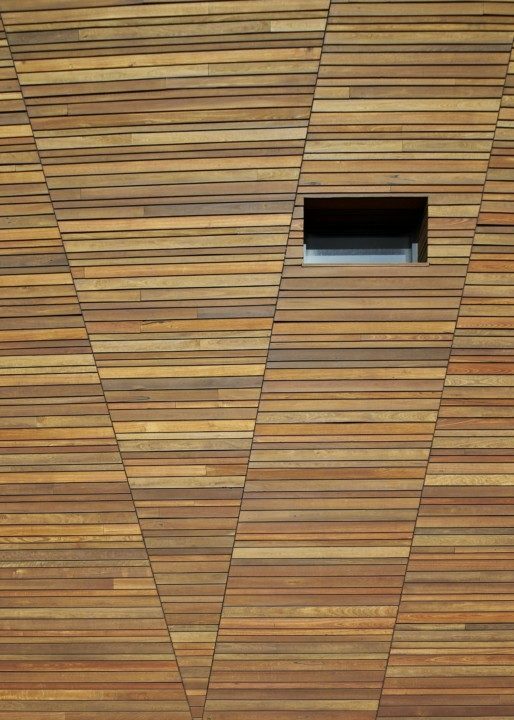 While some architects would have been disinterested in taking on this project, k20 Architecture saw this as a challenge. Coming up with a scheme that would meet the revised budget required a considerably different approach than the one that was initially envisaged. 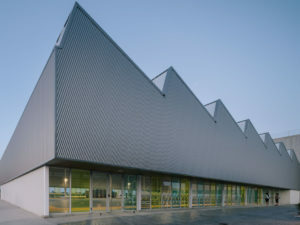 However, irrespective of the cost, k20 Architecture followed up on their aim to use local materials and trades wherever possible (at least 80 per cent was achieved) to create a sustainable outcome. 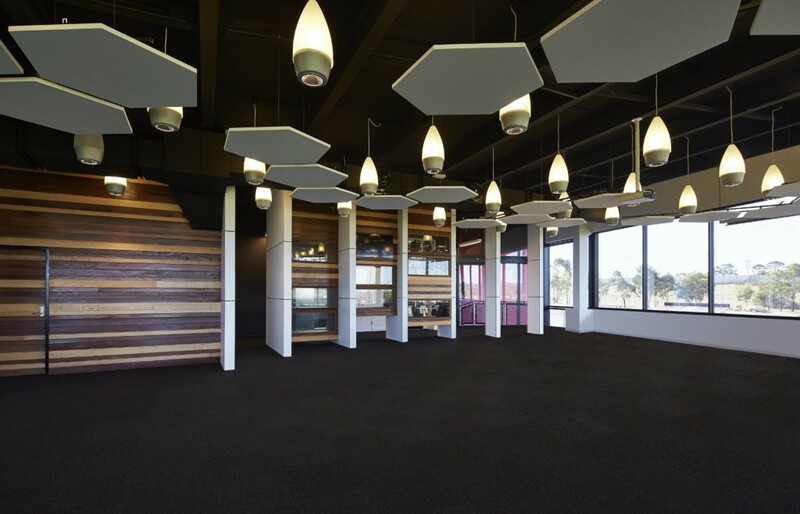 “We weren’t interested in transporting materials from the other side of the world when you can find suitable materials in the immediate vicinity,” says k20 Architecture Director Theodore Kerlidis, who was keen to capture the local voice from Ballarat. 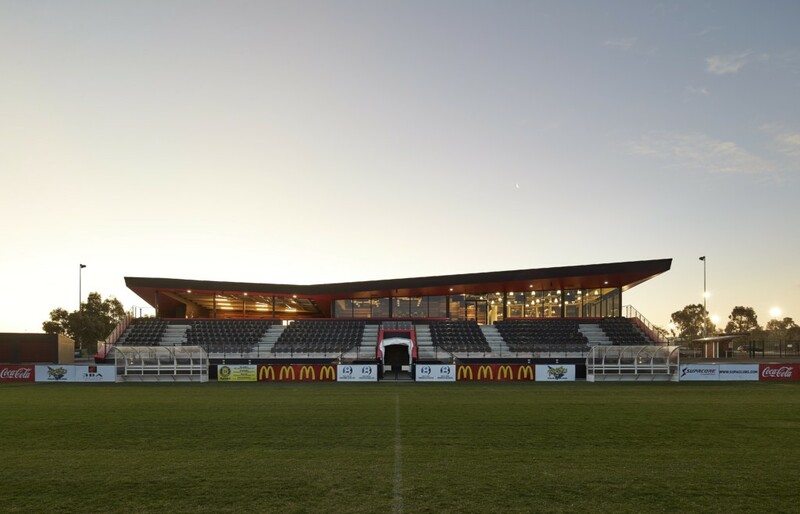 The design concept emerged as a response to clients brief to provide a new soccer facility for the local community which was to include sporting and social functions at the regional level. 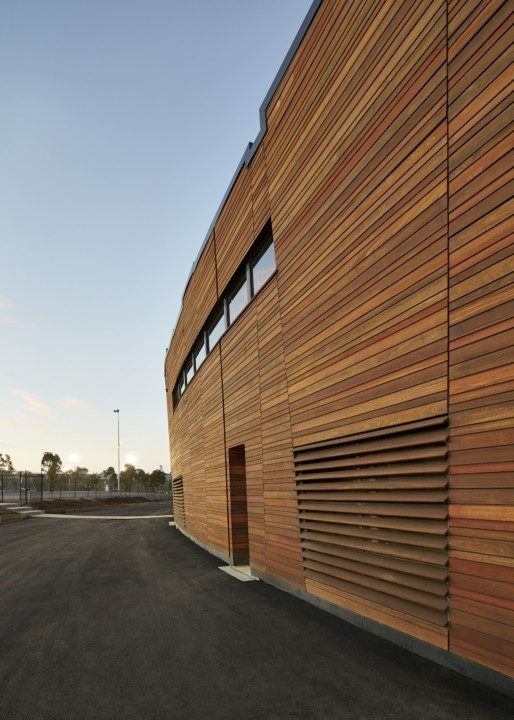 k20 Architecture exceeded the Client’s expectations by allowing the design of the new facility to appeal to national elite A level soccer teams as well as international soccer teams, whilst allowing the stadium to be the cultural and political heartland of the community. With Ballarat’s rich cultural heritage in mind, the concept of the Eureka Stockade wall emerged as the leading design principle for the BRSF project. The Eureka rebellion, which is often referred to as the ‚Eureka Stockade‘, is a key event in the development of Australian democracy and Australian identity. The Battle of the Eureka Stockade was fought between miners and the Colonial forces of Australia on 3 December 1854 and named for the stockade structure erected by miners during the conflict. The stockade itself was a makeshift wooden barricade enclosing about an acre of the goldfields, the new site sits just on 2 acres. k20 were seeking a deeper and valuable cultural link between the facility and its community which would allow the program to gain momentum. 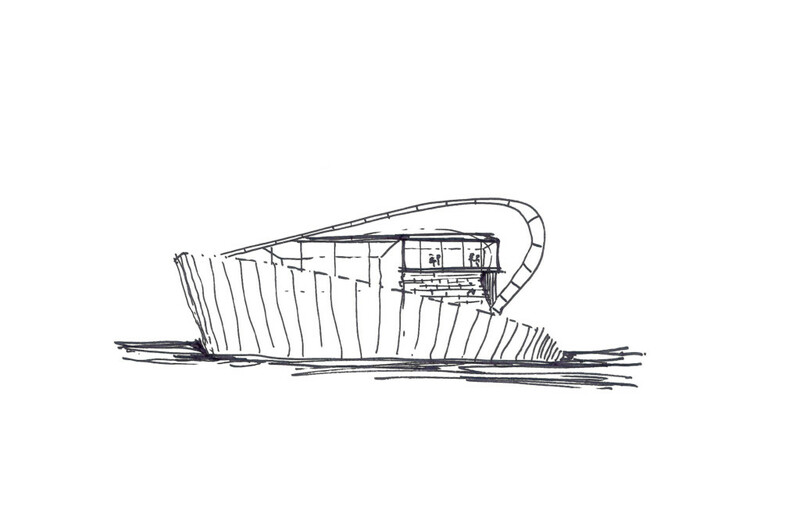 The design concept of the Stockade was the catalyst for the client to believe that it could progressively continue to build on the foundation of this work: with each progressive stage the stockade will simply be expanded on to create the stadium. In contrast to the original heavily fought over wall the Stockade by k20 Architecture is intended to depart from its charged history of conflict. 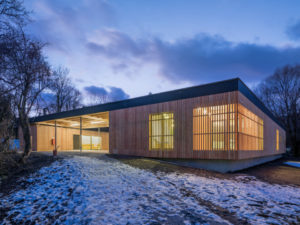 The motif of stockade connects program with place, and place with people and was designed to embrace the community and protect the building’s program and playing field from the prevailing winds and harsh western sun. 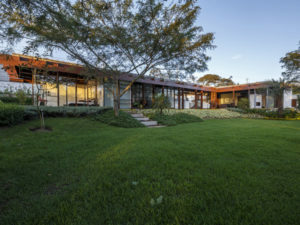 The wall emerges from the landscape and is made up of equal proportions of grey ironbark, spotted gum and stringy bark. Its curvilinear form in plan is the starting point for the stadium which contains the grand stand with 500 seated capacity, conference and catering facility for 200 people, external viewing decks and players change rooms, media rooms, and sports administration facilities. 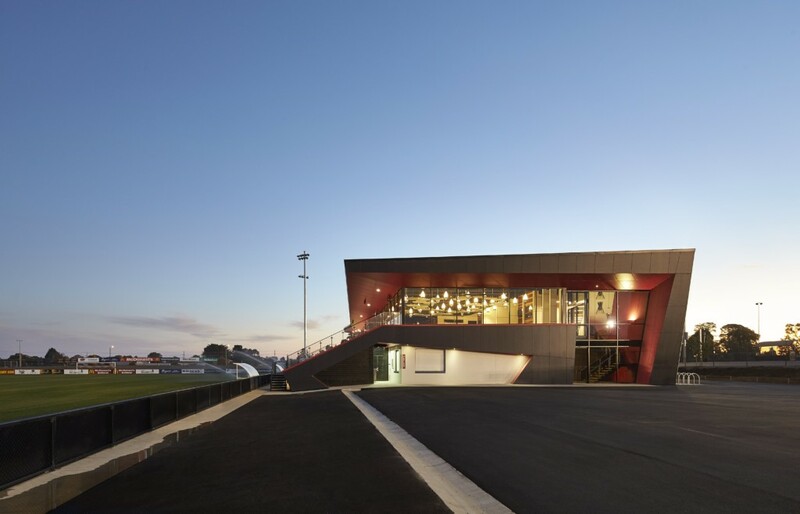 In addition to the distinct and rugged outline of the Stockade wall, the BRSF building is characterized by distinct sectional cuts to the North and South accentuated by bold black skeletal forms and flashes of red in the eaves, the team colours of the local host team the Ballarat Red Devils. 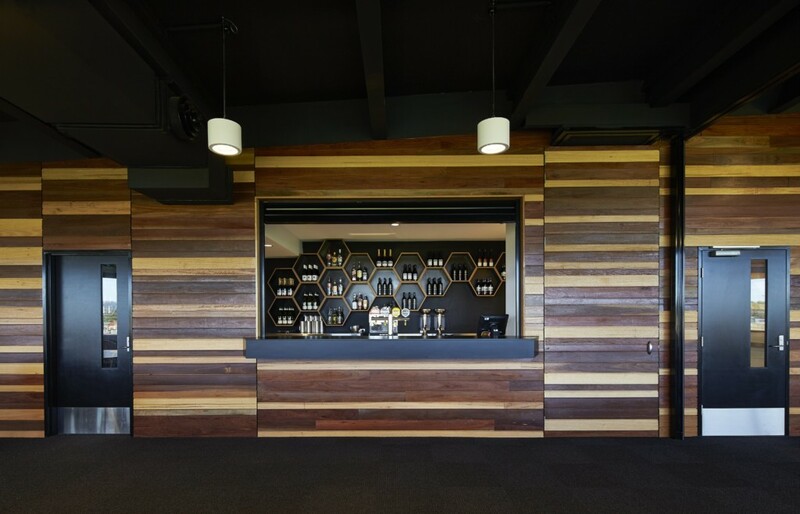 The entry to the building allows a visitor to see into the heart of the club with the clubs honour wall and function rooms visible via the double height glazed entry. 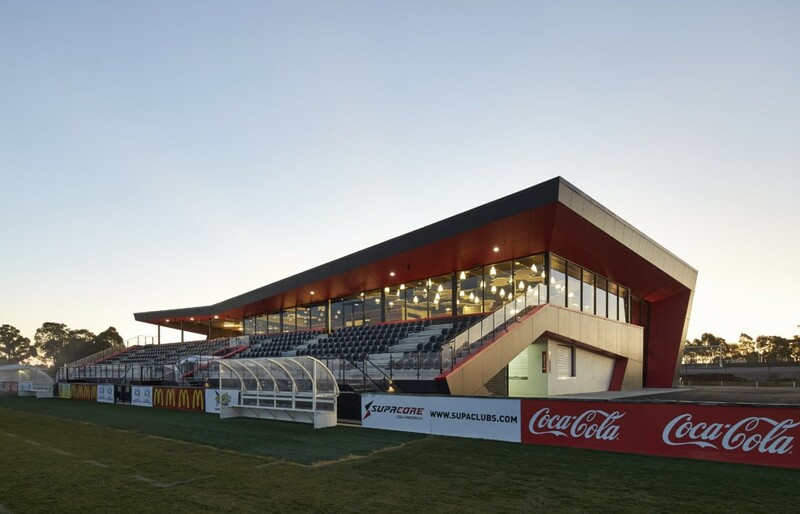 The facility is unique in that it has been designed specifically for the soccer community of regional Victoria. 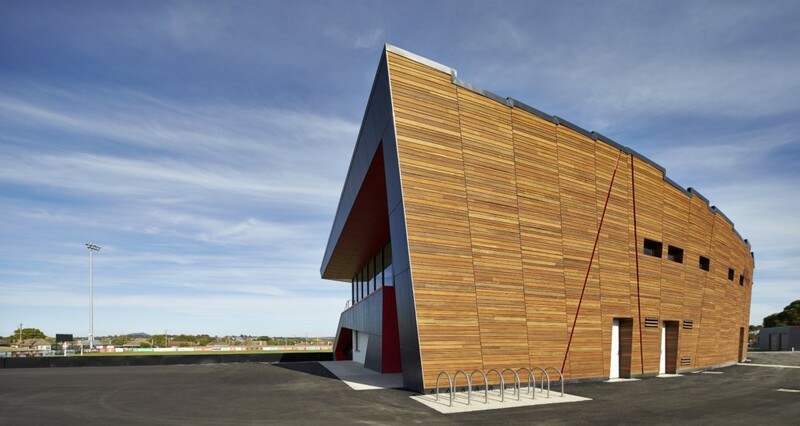 As a result, k20 Architecture designed the facility to emulate the experience of a world-class soccer stadium. This is illustrated in the alignment of the primary player’s race to the centre line of the playing pitch, which enables players of all ages and standards to experience key aspects of playing on the “big stage”.